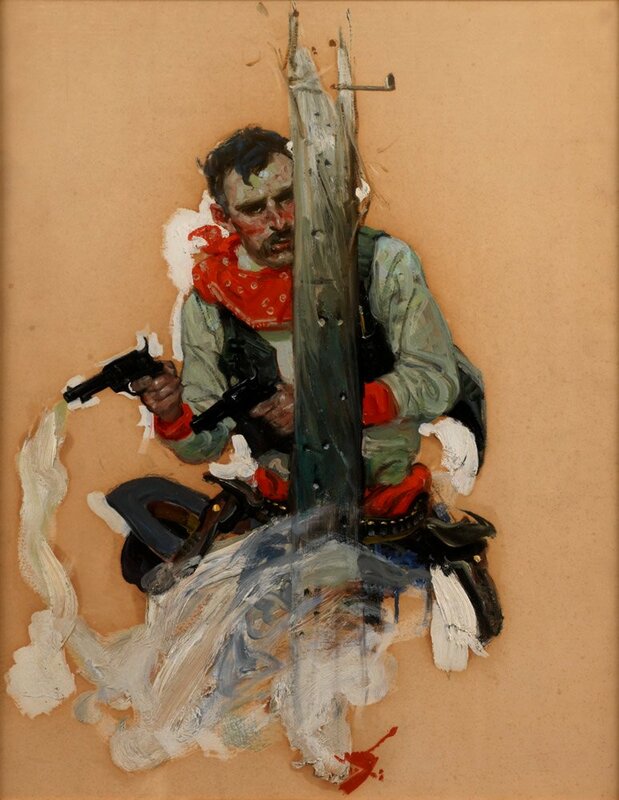 Description: Cowboy with guns drawn hiding behind post. Comment: I don't know all that much about Schlaikjer... in fact to underline that... I long thought this this work was by Al Simpkin and not Schlaikjer. I have to trust people who know more than I do and in particular my friend David Saunders shows on his website other works with the same stylized signature as being by Schlaikjer. David knows the pulp world as well, and probably ultimately better, than anyone. So, that's sufficient for me. Now, what does not appear on “Field Guide to Wild American Pulp Artists” is an indication of where this piece would have appeared. It wouldn't surprise me if it turned out to be for West, but have fallen short in trying to establish that thus far. Condition	 Board is browning with acid. Overall though good for it's age. Tastefully framed.